Directions: From Denver, take I-70 east to the Quebec/Northfield Exit. Head North on Quebec and make a right onto Prairie Parkway (there are signs to the refuge). Turn left onto Gateway Road and enter the gates to the park. Follow this road to the Visitor's Center and head south to 6th Ave. Follow 6th Ave, Wildlife Drive, east until it becomes a good dirt road and the road dead ends. The parking area and trailhead are on the right. 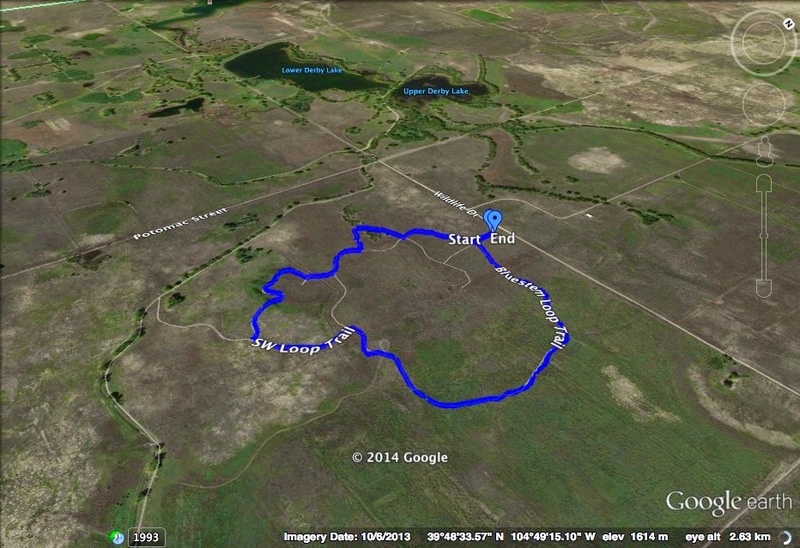 The Bluestem Loop is located about as far east in the refuge as the public is allowed to access. The hike consists of a loop through the prairie and seasonal wetlands. There is a boardwalk covering a good portion of the trail, but in July it is typically dry. The trail is hot one as there is little shade, but summertime brings nice wildflowers and a good view of the front range mountains. This is a very peaceful and quiet trail, it sees few visitors, and makes for a wonderful evening hike after the summer storms have moved through.